There is an old soul lurking in the body of guitarist Johan Lindstrom. I mean both the body corporal and his guitar body. His septet recording Music For Empty Halls draws the ear back to a time when music was less rushed and much more thoughtful. He's assembled a collection of compositions in a most considerate manner. He's done that by composing and arranging the music, and by choosing just the right combinations of performers and varied instrumentation for each piece. Lindström, a member of Per Texas Johansson's band and the group Tonruket, may be better known as a music producer. He brings those skills to the collection sounds here, imparting the necessary moods. His American counterparts might be Kip Hanrahan and Jon Lundbom. With Hanrahan he shares a distinctive feel in his productions, and like Lundbom, his guitar coats and conjures each composition. The music is cinematic although there is no movie to score here. Opening with the blues-inflected "Serengeti," the forward impulse of the intoxicating guitar and organ are propelled by the bottom ends of his front line. Lindström chose heavyweights, Johansson and Jonas Kullhammar plus Mats Äleklint (Angels, Paal Nilssen-Love's Large Unit) to man the brass and reeds. The music transitions into larger vistas with "Dance Of The Marble Hearts," with fitting arrangements that never seem to crowd the music. That soundtrack theme reappears multiple times here, "The Run" takes you back to Henry Mancini's hardboiled "Peter Gunn" theme, and "Europe Endless Boogie" borrows a thought from Bob Dylan's "Everybody Must Get Stoned." In between there are more sympathetic sounds. "Music For Empty Halls: Part 2" and "Elegy Of The Golden Age" are gentle, yet emotionally evocative pieces that maintain the theme. The sequencing of the music is part of its charm and magic. Kudos to Lindström for making a complete album of music, and not just individual tracks. Track Listing: Serengeti; Dance Of The Marble Hearts; The Run; Elegy Of The Golden Age; Music For Empty Halls: Part 1; Europé Endless Boogie; Music For Empty Halls: Part 2; Sleepless Lapsteels; The Assent; March Of The Comodos; Hymn (För Dom Anhöriga). 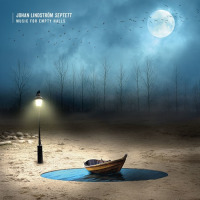 Personnel: Johan Lindström: guitar, pedal steel guitar, percussion, fx. piano; Jonas Kullhammar: alto saxophone, tenor saxophone, baritone saxophone, bass saxophone; Jesper Nordenström: piano, organ; Per “Texas” Johansson: clarinet, bass clarinet, contrabass clarinet, tenor saxophone; Mats Äleklint: bass trombone, trombone; Torbjörn Zetterberg: double bass, electric bass; Konrad Agnas: drums, percussion; Edda Magnason: vocals; Sofie Livebrandt: vocals; Ulf Forsberg: violin; Ulrika Jansson: violin; Ingegerd Kiergegard: viola; Helena Nilsson: cello.